The Highly Impressive Specs of the Upcoming 5G Service have already won us over! April can’t come soon enough! While some people are eagerly waiting for the month due to Avengers: Endgame and the final season of Game of Thrones, there’s an even bigger reason to be excited about it. Yes, we will be getting our first glimpse of the 5G coverage in a couple of weeks! The hype is real and as of now, the revealed specifications of the new mobile internet service are signifying that it will easily outshine the existing 4G/LTE service. The features to be highlighted here are the improved bandwidth, latency and a massive number of simultaneous carriers. These improvements are way more important than they seem, as they will be essential for automation and other important purposes in the future. Although South Korean mobile providers were all set to be the first ones to launch the service by mid-April, Verizon (US Provider) has announced that it plans on rolling out the 5G service on 11th April. This announcement has caused the Korean providers to do everything in their power to push up the launch date on their end. No matter who ends up releasing the service first, it will be a win-win scenario for consumers. The service will initially be offered in limited areas. However, KT Corp has assured everyone that it plans on building 30,000 5G network stations across the country (South Korea). If our calculations are correct, this would make the service available in almost 85 cities before 2020. 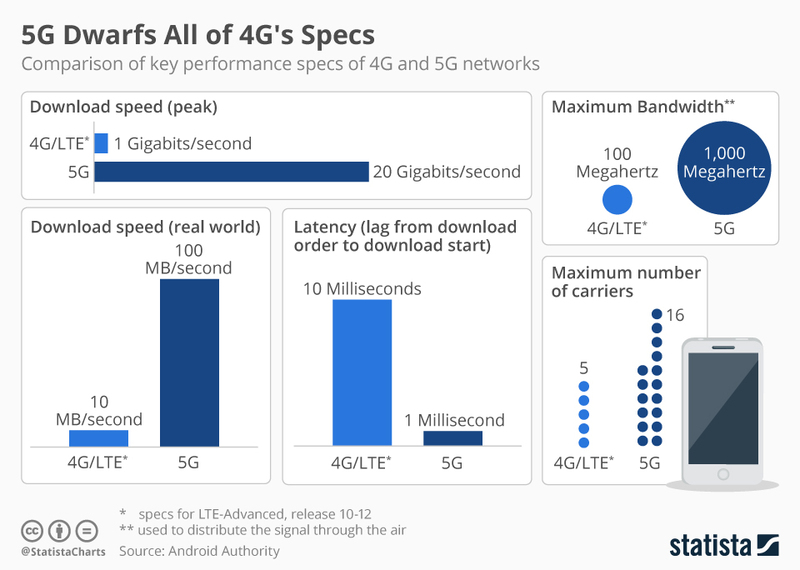 The below chart compares different 4G and 5G specifications.